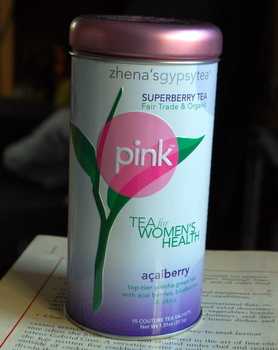 Zhena’s Gypsy Tea PINK Acaiberry Green Tea is part of the PINK Tea for Women’s Health line from Zhena’s Gypsy. The line includes teas made from superfruit berries, including cherries, pomegranate, cranberries and cacao berries, that are high in antioxidants and other beneficial compounds. 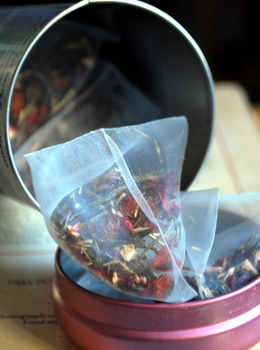 Additionally, a portion of the proceeds from the sales of tea in this line go towards The Breast Cancer Research Foundation. The Acaiberry tea reminded me a lot of the Tazo Passion tea, except that the flavor of the green tea base actually came through the fruitiness slightly. It gave the tea a very clean, refreshing feel. Overall, the flavor was very fruity, somewhere between a strawberry, a kiwi and a grape – which boils down to it having an acai berry flavor, which is quite hard to pin down if you’ve never had it before. A great summertime tea, this one, like the Strawberry Kiwi Tea I tried not too long ago, also makes good iced tea. Unlike the Strawberry, which was excellent plain and sweetened, I would prefer this one completely unsweeted for iced tea so that the subtle flavors of the fruit can come out.